Feeling sleepy, cold and sluggish this winter? 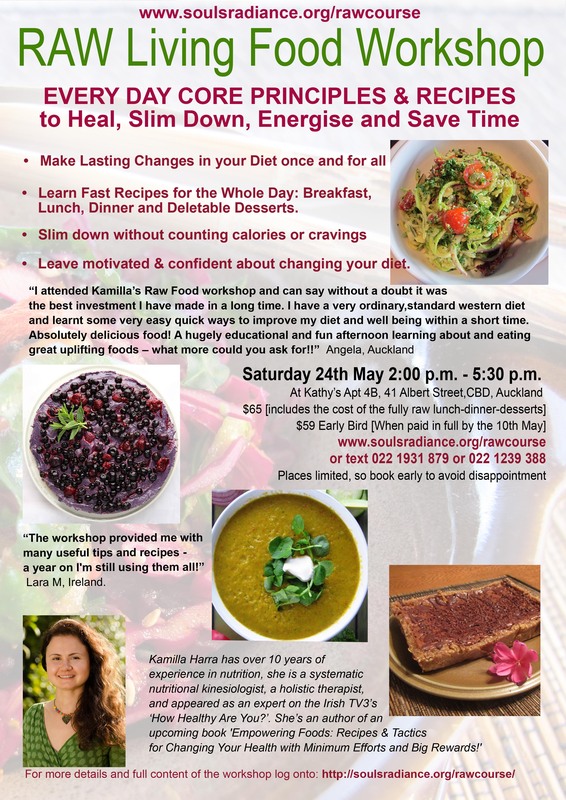 Simple common sense ways and recipes to greatly improve your energy levels, your health, tone up, clean up and feel great by including just some of what you’ll learn on the day! All without dieting, restricting calories, avoiding fat, avoiding sweet things in life! (1) Living Lunch-Dinner with desserts included. (2) Notes for the principles above. (3) Recipes (printed and digital on request). Location: Kathy’s Apartment 4B, 41 Albert St, CBD, Auckland. Date & Time: 24 May 2 p.m. – 5 p.m.